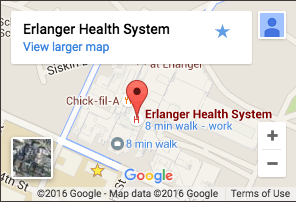 Erlanger provides the highest level of emergency care for critically ill or injured patients. Our 24/7 services range from highly specialized care from the region’s only Level I trauma center — to lifesaving procedures from our Accredited Chest Pain Center and world-renowned rapid-response stroke team. No other hospital is more prepared for any emergency, or offers more to help our community receive the right care when the unexpected happens. We’re proud these services have earned the confidence of an entire region — as your choice for “Best Emergency Room” in the 2016 “Best of the Best” awards from the Chattanooga Times-Free Press.